It’s blank now, but hopefully I will share a finished picture soon… I am sharing my FREE printables for you to use in the meantime. One is a multiplication wreath. Directions are included. My plan is to hang some of the finished ones on the fireplace and the rest somewhere else. Click here to download this multiplication wreath! 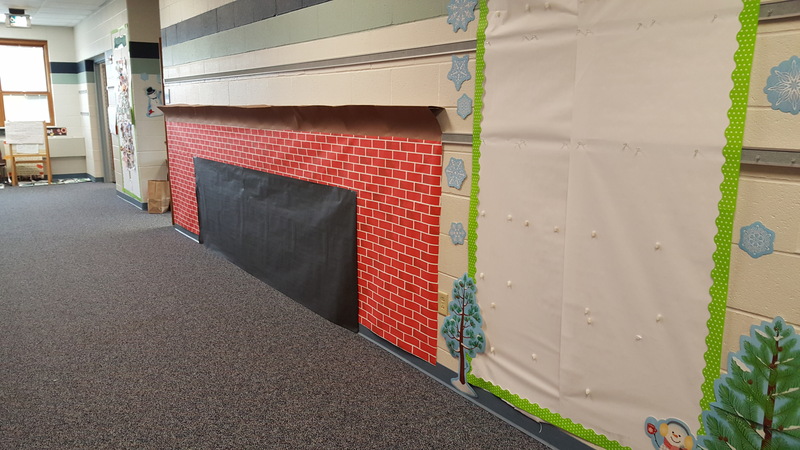 Every fireplace needs a fire… Each student will receive a flame. They will cut non-fiction text features out of Scholastic News and glue them to the flame. They will place a frame over the flames and write the purpose of each feature. Click here to download flaming for text features printable! Last, since we are reading a George Washington Novel in ELA, the students will create a directed drawing of George and then write two facts they learned about George Washington from the text we read. I created a frame to frame the directed drawing in. Click here to download frame for a directed drawing. Hope you have a wonderful December in your classrooms!!! Advent Printables – Roll a Wreath and Jesus Candy Cane! Who is Under the Sheet Freebie + More! !